What a nice weekend after a big rain storm on Friday. The gardens and flower beds sure got a good drink. Saturday and Sunday were absolutely great for weekend things going on. Hoping for more nice weather, but lately I heard there is to be rain almost all week. Of course, sometimes those weathermen are wrong, so that could change. I would like to thank Brian McGuire, Brian Wettlaufer from Dennis Wettlaufer’s Logging, Bob Burke, Mike, Heather, Kaeliegh and Kyleigh McDonald, Claire Johnson, Gaige Burke and Theresa, Maddy, Macrina, Julianna and Irena Pochatko for all their help on the EUB Cemetery project. Much appreciated and job well done. Still needs a couple of “tweeks”, but that will be done shortly. Rev Mother Christophora, Ellwood City; Andrea Anderson and Chester (her Shitzu) Bowmanstown; and Tom, Kristin, Tai and Luke Iwancio, Harrisburg, spent the weekend at St. Nicholas House and attended the anniversary celebration at St. Vladimir’s Church on Sunday. I know there were a lot of folks here to take part in the Church festivities and heard it was a wonderful time. I see Tent City had quite a few folks in for the weekend to enjoy their time here. We have grandson, Tyler McGuire, Hunlock Creek, for another short vacation before school starts. We all enjoyed the mineral club picnic on Sunday at Satterlee Creek Park in Litchfield. He’ll have one more vacation in August to look forward to. Old Home Day will be here before we know it. The first Saturday and Sunday in August, the 5th and 6th there will be lots going on. Check the Sully for the ad and details. Mark your calendar now. Jean Foust, Colley Township Tax Collector, will be at the Lopez building on Tuesday, August 22nd from 9 a.m. to Noon and also August 29th from 3 to 6 p.m., for those who wish to pay their taxes in person. They can also be mailed to her at the address on the tax paper. Jean will also be at the Colley building on Wednesday, August 30th from 9 a.m. to Noon. Congratulations to V Rev Mother Christophora who will have thirty years at the Orthodox Monastery in Ellwood City on the 19th. Happy Birthday wishes to Evalyn Lansberry and Sr. Ella Mae McDonald, 20th; Matt Beaver, 21st; Jan Marie Manual, 25th; Carole Kilgus, 28th; Madison Burke and Matt Dayton, 29th; and Casey Bonardi, 30th. Hope you all have a good day. B’s gang sends birthday wishes to Billy Stasiak who celebrates on the 23rd. Have a super day. I know there are probably going to be things going on around the County, so keep an eye on the Sully for where and when. Might be something you’d be interested in. Next 4-H Rocketry meeting will be on Monday, July 24th, 2:30 p.m. at the Extension Office in Dushore. Guess that’s the news for this time. Enjoy your week, even if it is rainy; should be warm. Have news give me a call at 570-928-9238; mail me; see me; or e-mail me at news@lopezpa.com. I’ll get it in for you. Thanks for reading and I’ll be here next time. 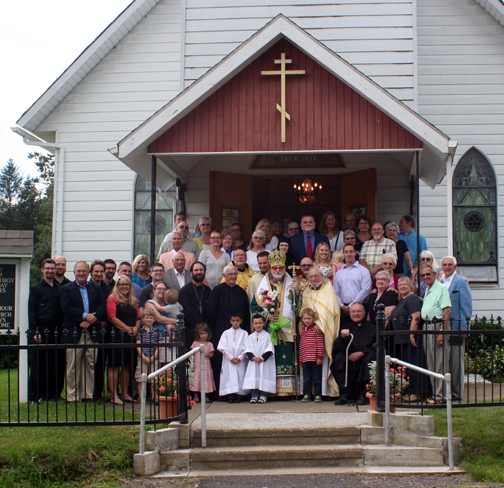 On Saturday, July 15th, St. Vladimir’s Church in Lopez celebrated it’s 110th anniversary. 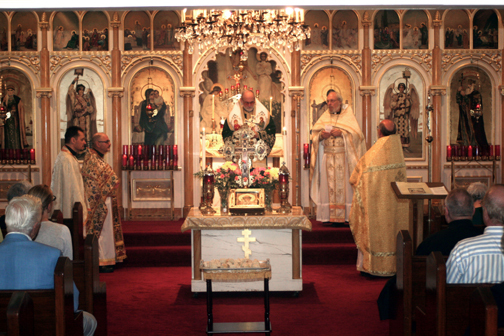 Since 1907, the community of St. Vladimir’s Orthodox Church has been an integral part of life in the village of Lopez and is the only Orthodox Church in Sullivan County. St. Vladimir’s is part of The Diocese of Eastern Pennsylvania of The Orthodox Church of America. They started the celebration with Divine Liturgy with His Eminence Archbishop Mark of Eastern Pennsylvania; celebrant, Pastor Rev. Dennis Hendershot, area clergy co-celebrants; responses by Reader Robert Neufer and the Male Quartet of St. Tikhon’s Monastery Chamber Choir. They also had services for departed clergy, founders and family members of St. Vladimir’s Church. At Noon there was a picnic and entertainment on the Church grounds. There was a concert of sacred music presented by the a cappella Male Quartet also. 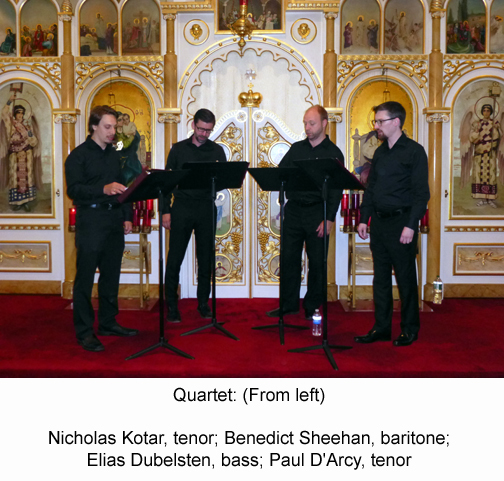 This Male Quartet is a professional a cappella vocal ensemble under the auspices of St. Tikhon’s Monastery in Pennsylvania, America’s oldest Orthodox monastery. Founded in 2015 by artistic director, Benedict Sheehan, the Chamber Choir’s mission is to explore and promote the tradition of sacred music in America. The group is comprised of notable sololists and ensemble singers from the Northeastern United States. There were many local, out of towners and out of state folks that attended this special occasion and all enjoyed a nice time. Weather was perfect for the day.